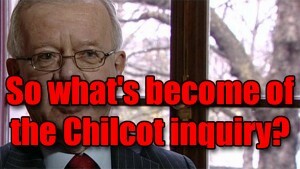 Stirring Trouble Internationally: Asking: What’s Become Of The Chilcot Inquiry Into The War In Iraq? Asking: What’s Become Of The Chilcot Inquiry Into The War In Iraq? In today’s news from Stirring Trouble we revisit the Chilcot Inquiry and find out what’s been going on with it. Reminding people that the Chilcot inquiry has yet to produce a report on its findings.